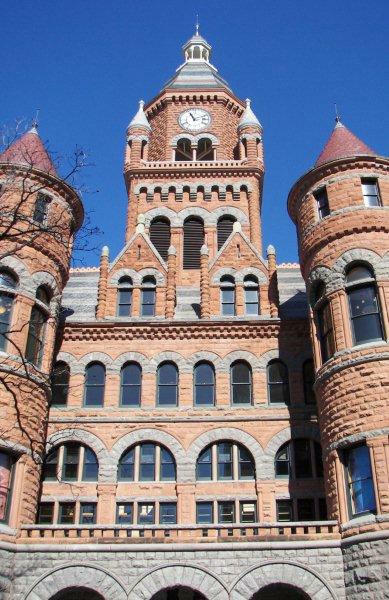 Dallas County Courthouse Dallas Texas. 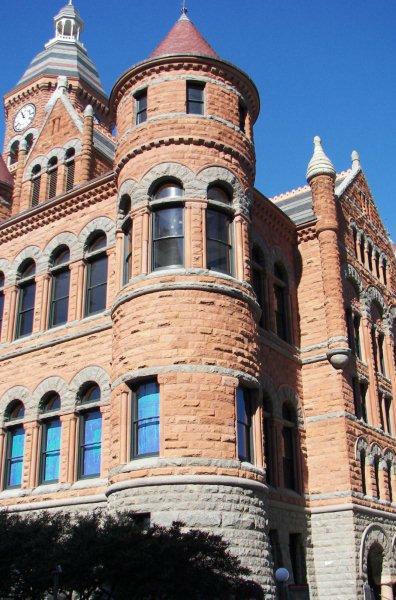 The 1966 Dallas County courthouse has been remodeled with a large addition to the east side. 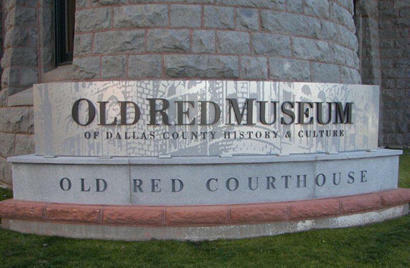 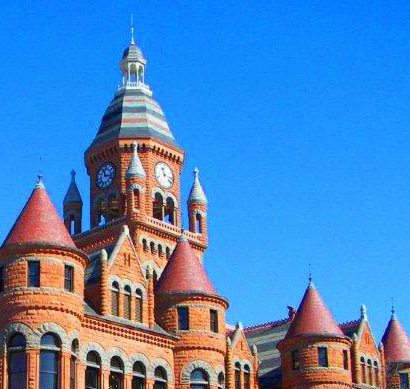 The 1892 Dallas County Courthouse "Old Red"
Designated as public land in John Neely Bryan's 1844 city plat, this was the site of a log courthouse built after Dallas County was created in 1846. 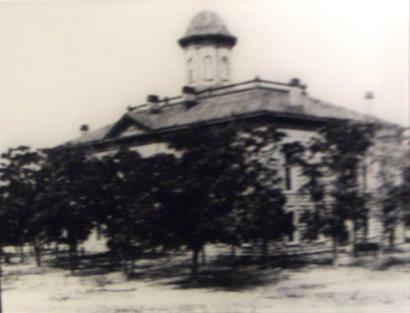 When Dallas won election as permanent county seat in 1850, Bryan deeded the property to the county, and a larger log structure was erected. 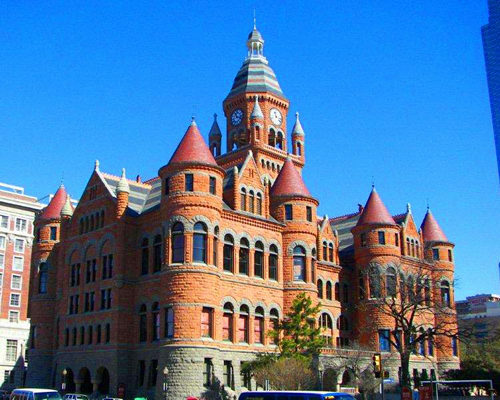 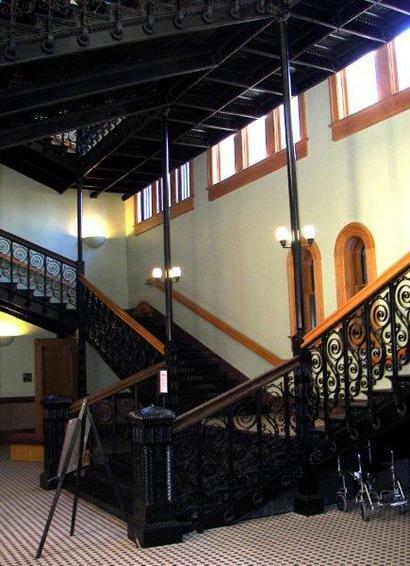 In 1856 county offices occupied a 2-story brick edifice, rebuilt in 1860 after a fire that almost destroyed the city. 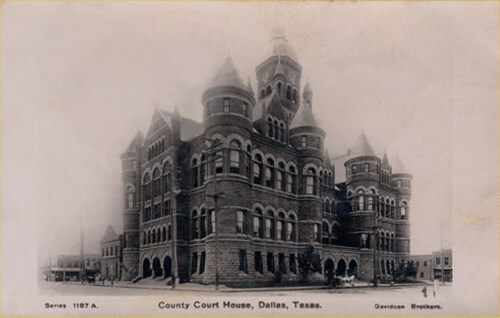 The fourth courthouse, a 2-story granite structure erected in 1871, survived one fire in 1880 before it burned again in 1890. 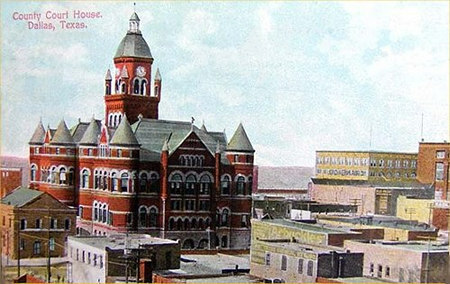 The Old Red Courthouse, the fifth seat of county government, was begun in 1890 and completed in 1892. 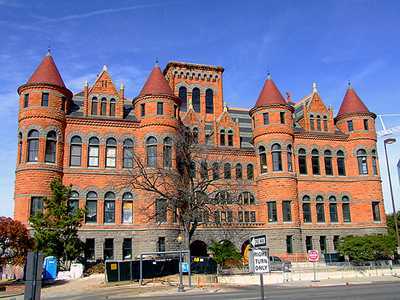 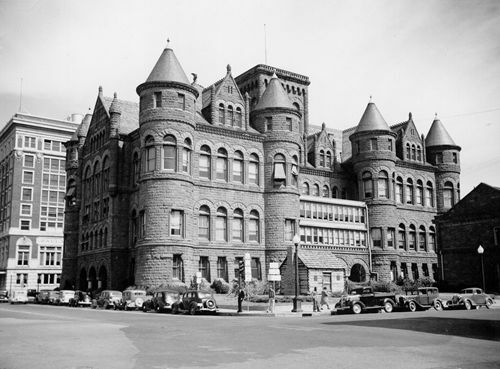 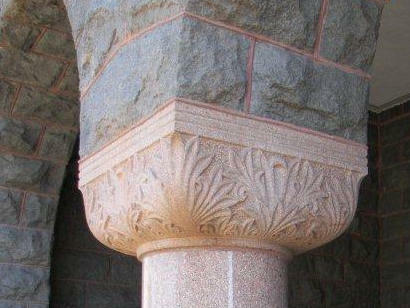 Designed by Architect M. A. Orlopp, it exemplifies the Romanesque Revival style with its massive scale and rounded arches. 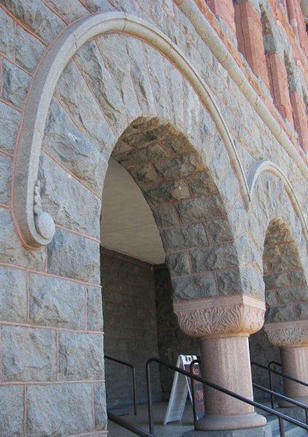 The blue granite of the lower floor and window trim contrasts with the red sandstone of the upper stories. 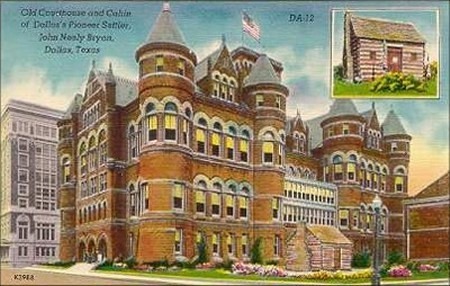 Eight circular turrets dominate the design. 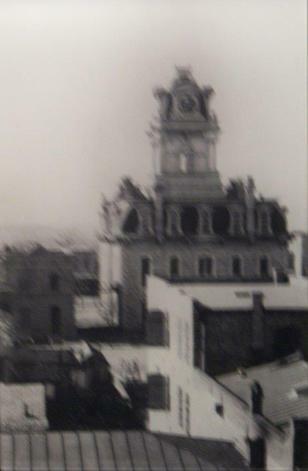 A clock tower with a 4500-pound bell originally topped the building, but it was removed in 1919. 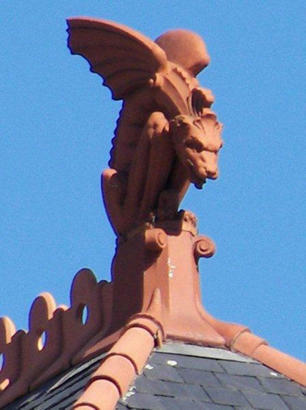 Two of the four clay figures perched on the roof have also been removed. 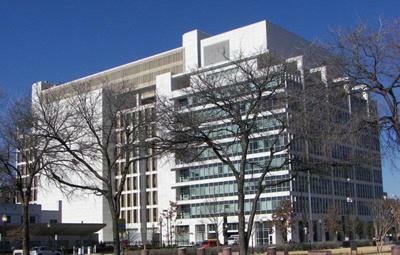 To house the expanding county government, a new courthouse was built in 1965. 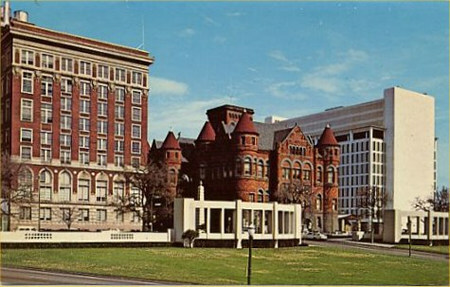 Some offices remained in the 1890 structure, which was renovated in 1968. 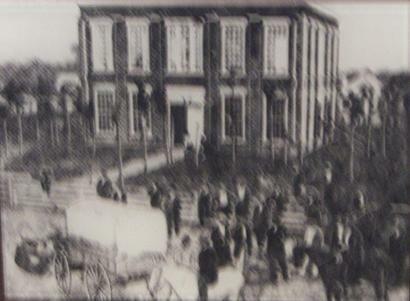 Notice the cabin of Dallas' Pioneer Settler, John Neely Bryan, in front. 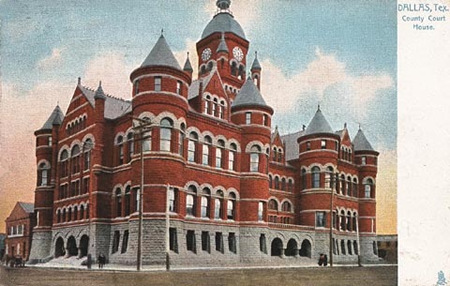 The central clock tower, absent since 1919, was reconstructed and completed in the summer of 2007. 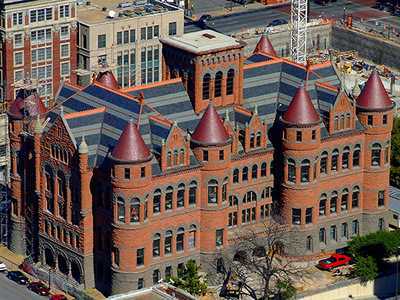 It rises 205 feet above the street. 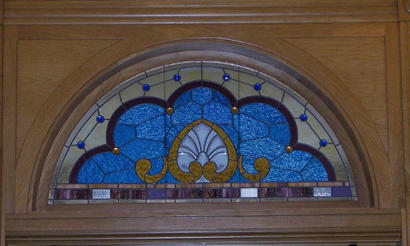 Stained glass transom over west side entrance. 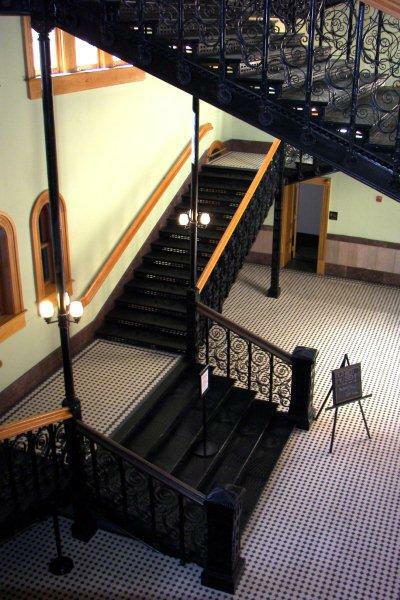 Looking down from the second floor. 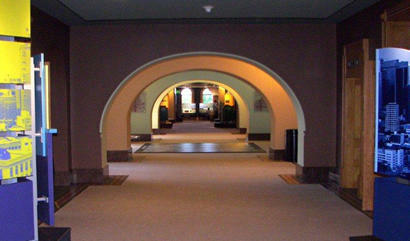 Second floor hallway. 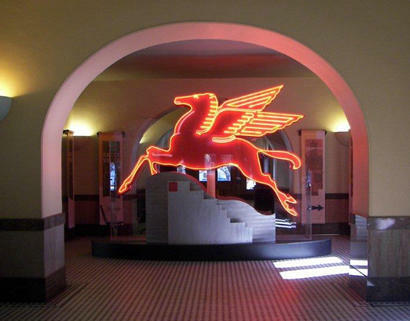 Each room on the second floor is filled with display cases and interactive, multimedia kiosks which educate visitors about the history of Dallas and Dallas County. 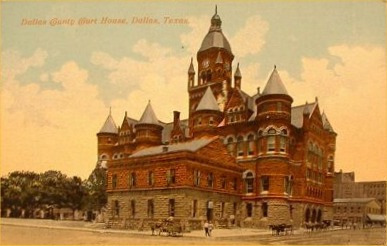 "Old Courthouse and Cabin of Dallas' Pioneer Settler, John Neely Bryan." 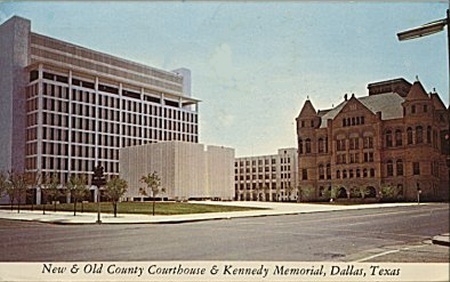 "New & old County Courthouses & Kennedy Memorial, Dallas, Texas." 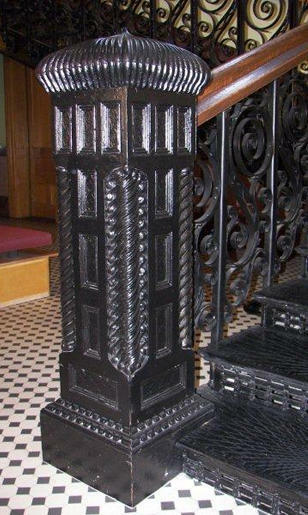 Photo from a display case at the Old Red Museum.